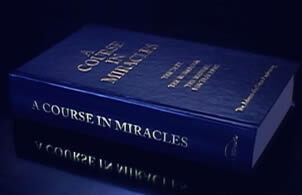 A Course in Miracles (ACIM) is a book that aims to assist its readers in achieving psychological transformation from ego-based thinking and societal conditioning (judgment) to one of inner peace and acceptance. The book describes a purely non-dualistic philosophy and includes practical lessons and applications for the practice of acceptance and a unique form of forgiveness in daily life. The Text and Workbook span a 365-day period, though most students take longer to complete the Course. Many continue to re-read the Text and do the daily lessons for a lifetime. From Stephanie: I was hesitant for many, many years to start A Course in Miracles, because the language was very Christian. Though born and raised in the southeastern U.S., I was more of the mindset of Ghandi when he said, "I like your Christ, but I do not like your Christians." I had met many people growing up in the South, calling themselves Christians, who seemed severely judgmental and unhappy. But eventually my own pain was great enough, I started reading the Text and doing the daily lessons and realized this was a very different Jesus and a very different type of forgiveness work. The result for me has been that my mind and my life have been changed from frequent upset to abiding inner peace. There are many ways you can explore this program. Videos abound, as well as many books (I use "A Course in Miracles for Dummies" because the language is difficult to understand for many) and websites. Another option is using Oprah's Website, where she showcases one of ACIM's most famous teachers, Marianne Williamson, who interprets each of the 365 Workbook Lessons, allowing for free daily access in easy-to-understand language. Return from "A Course in Miracles" to "Home Page"?